Home / Stories and Information / Buying Tips / Peridot. The August Birthstone. This birthstone is the gem variety of the mineral Olivine, which is found in peridotite rock, formed inside the earth’s mantle, and brought to the surface by volcanoes. Perhaps this is why people in Hawaii believe that Peridot symbolises the tears of Pele, the goddess of fire who controls the flow of lava. The recognisable lime green colour comes from the composition of the mineral Olivine itself, which is why it is one of the few stones that only comes in one colour. However shades of Peridot vary from yellow-green to olive and a brown-green. The majority of Peridot stones are found in Arizona. Other sources are China, Myanmar, Pakistan and Africa. 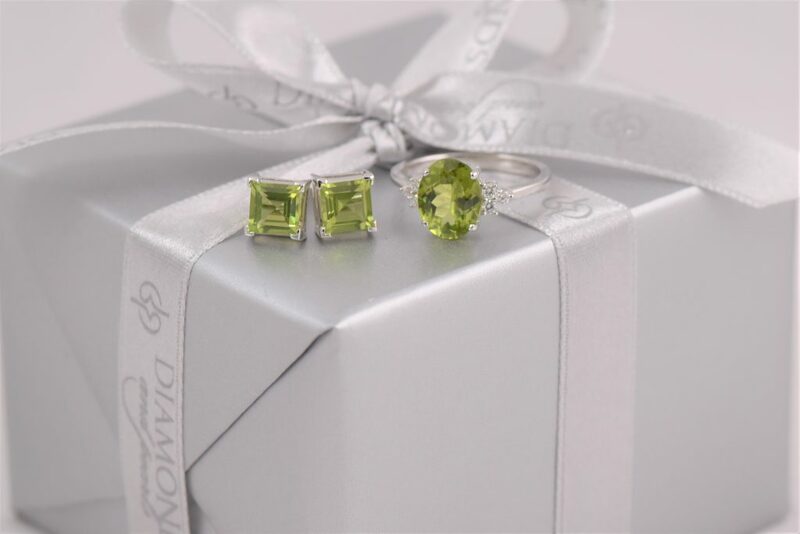 Shop these peridot and yellow gold earrings here. View the peridot and diamond ring in our feature image here. 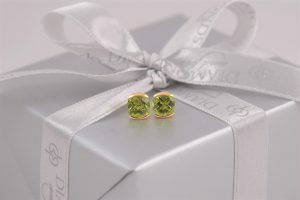 The square cut peridot earrings in our feature image are not yet on or website, for more information, contact us below.